March 28, 2014 /0 Comments/in Foot Health & Hygiene /by Jenn F.
When was the last time you looked at your feet? We’re not just talking about noticing that your toenail polish could use replacing — but rather, when was the last time you really examined your feet from top to bottom? You can think of the feet as a snapshot of your total body health. If you have some sort of systemic problem going on, the signs could manifest in your feet. They also act as fortune tellers, revealing what might happen if you don’t take a minute to pamper them right away! In this article, we’ll discuss a few signs you might look for as an indication of your overall health. 1. Spoon-shaped indents: If you have spoon-shaped indents that are slightly sunken in, you may have anemia caused by internal bleeding, ulcers, dietary inefficiencies or menstrual cycles. 2. Charley horse cramps: If your feet cramp up all the time, you may be lacking in calcium, magnesium, or potassium. You may also be dehydrated. Pregnant women in their third trimester often complain of this pain. 3. Non-healing wounds: A sore that won’t heal after weeks may indicate that you have peripheral arterial disease or diabetes. Elevated blood glucose causes nerve damage, so you may not feel the pain of a cut until it becomes an ulcer. If left untreated, ulcers can become infected and may lead to amputation. 4. Cold sensation: Women over 40 with cold feet may suffer from hypothyroidism — a poorly functioning thyroid gland, which regulates metabolism and temperature. Other signs include poor weight loss and fatigue. 5. Numbness: Numb feet indicates damage to the peripheral nervous system that runs from the brain, down the spinal cord and to the feet. Neuropathy is often linked to diabetes, but it may also occur as a result of trauma, infection, metabolic dysfunction, or exposure to toxins, says the Mayo Clinic. 6. Dry, red, flaky skin: Athlete’s foot is a common fungal infection that begins as flaky, dry, red skin between the toes and progresses to itching, inflammation, and blistering. Luckily, an over-the-counter topical cream can clear up this embarrassing, uncomfortable problem. 7. Stench: Are your feet often wet and stinky? Foot odor is caused by two things: sweat and bacteria. Some people suffer from a medical condition called hyperhidrosis, which is excessive sweating. You may also have neglected to sanitize your footwear regularly, so bacteria has built up inside your shoes. Sweat does not smell, so it’s really the bacteria that is feasting upon your sweat that is causing all that odor. In addition to the conditions mentioned, you may notice deformities in your feet if you look very carefully. You may notice bunions — bony lumps alongside the big toe, caused by heredity and improper footwear. And there are hammertoes — a curling under of the smaller toes in response to crowded toe boxes on your shoes, often seen alongside bunions. Neuromas are another thing to look out for — marble-like nerve inflammations on the balls of your feet. Then there are corns — soft-tissue growths on the tops of the toes. You will need to see a podiatrist if you spot any of these structural issues. Sanitize your shoes daily to protect your feet from a number of dangers. Clean, sanitized shoes can save you from many potential woes, including: infected ulcers, warts, foot odor, toenail fungus, cellulitis, and athlete’s foot. Sometimes a small cut can become a huge issue if it’s sitting in a warm, damp, enclosed swamp of microbes. 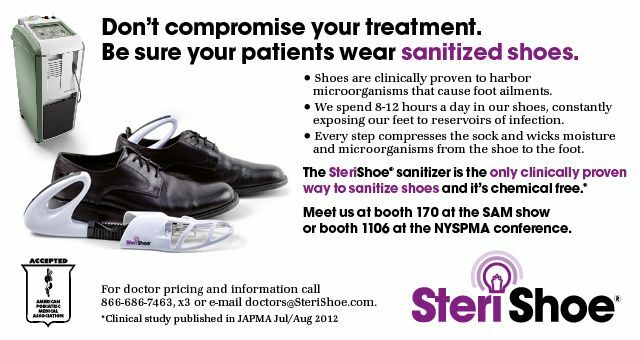 The SteriShoe ultraviolet shoe sanitizer is clinically proven to kill 99.9% of the pathogens in your footwear within 45 minutes. Buy our podiatrist-recommended, FDA-approved shoe sanitizer here. Can Garlic Treat Athlete's Foot? Am I At Risk For Toenail Fungus?